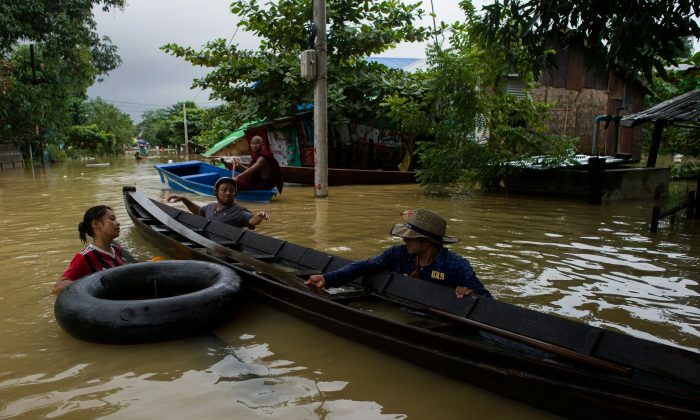 YANGON—Some 50,000 people in Burma (also known as Myanmar) evacuated their homes after days of heavy monsoon rains left villages inundated and swept away bridges, while authorities scrambled to deliver aid to the affected regions, authorities and media said on Sunday. President Win Myint visited the Bago region in central Burma to meet displaced residents on July 28 and urged local officials to step up the provision of temporary shelters and aid. An estimated 100,000 people may be affected by the floods. Parts of Burma flood annually at the peak of the monsoon season, causing frequent landslides and widespread damage to farmland and infrastructure in the Southeast Asian nation. The national disaster management committee on July 29 warned residents living near rivers and in low-lying areas to “immediately leave their homes as the water level…has exceeded the danger level,” according to state media on July 29. Torrential downpours washed away a section of a 200 feet concrete bridge in the northern Shan state, while rice paddies and roads in the central Kayin state suffered extensive damage, state media reported. “The U.N. in Myanmar is mobilizing its partners, resources, and capacity and is offering to provide support to the ongoing assistance delivered to the victims of the floods by the government of Myanmar,” said Knut Ostby, the U.N. resident, and humanitarian coordinator.